Are you or your family due for a checkup and clean? Need to have a same-day emergency treatment or denture repair? Our multidentist team and in-house laboratory allow us to deliver comprehensive oral healthcare in just one appointment, even on the weekends. Our practice offers comfortable and modern facilities, including free Internet, ceiling mounted televisions in each of our surgeries, a separate playroom for children and an Xbox and PlayStation in the reception area for older kids and teens. To stay up to date on your health history, we ask that each patient (new and existing) complete a new set of paperwork every 12 months. If applicable, please bring a list of your current medications or medical history that we can photocopy. Be sure to let us know if you have any allergies, such as reactions to penicillin or latex. Please bring your health fund card or Medicare card with you at the time of your appointment. We process all claims straightaway through HICAPS. 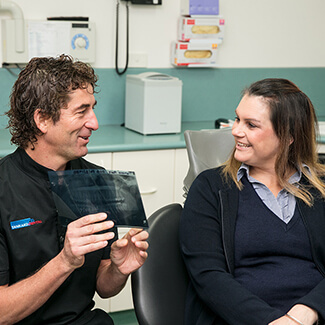 We’re the #1 provider for the Mildura Health Fund and accept all other schemes including Bupa, Medibank and Mildura Health Fund. Denticare financing is available to break your out-of-pocket costs into smaller payments that fit your budget. Patients enrolled in the health fund can receive a scale and clean, along with other preventive services with no money out of pocket, providing you have already served your waiting periods, are within your annual limits, and you hold an eligible level of coverage. We make nitrous oxide (“happy gas”) available upon request. If you want a little help relaxing, just let us know at the time you schedule your appointment. Happy gas is a convenient option for the nervous patient or child who feels anxious about visiting the dentist. Hospital visits for general anaesthesia procedures are another option that we provide. Our highly experienced team wants to make this a pleasant experience for everyone. Your time is valuable to us. If you’re being seen for a checkup, you can plan to be here for about half an hour. Contact our family practice today to book your first visit!